Epidermis forms the outermost layer of cells on the primary plant body. It is present over stem. roots, leaves, flowers and fruits. In most plant. epidermis is composed of single layer of cells. But two or several layers are also found in different plants. When it is composed of single layer, it is called hypodermis. When it is composed of many layers. it is called multiseriate epidermis. The root epidermis is called rhizodermis or epihlema. The main function of epidermis is to check the transpiration. It also protects the plant parts. It also has stomata for gaseous exchange. Epidermis is composed of single layer of cells. These cells are tubular. They have different shapes. Their shape may be isodiametric. elongated, t‘avy or rectangular. The epidermal cells are compactly arranged. The epidermal cells are highly vacuolated. Some leucoplasts are also present in it. Chloroplasts are absent in epidermis except guard cells. The ep:dermal cells contain many mitochondria. dietyosomes and ER. :the cell sap of epidermal cells of many flowers contains pigments called anthocynins. The outer walls of the epidermal cells become thick by the development of secondary wall. The outer walls have remnants of plasmodesmata called ectodesniata. Ectodesmata allow the passage of certain substances that are discharged through the cuticle. The redial and inner tangential walls of epidermal cells are thin and possess plasmodesmata. The Ns al I of epidermal cells bear cuticle. A thin layer of cutin on the epidermal cells is called cuticle. Cutin is deposited on the outer walls of epidermal cells in aerial parts. Cutin is absent in underground parts. The protoplasts of the epidermal cells secrete cut in Clain makes the Nall of epidermal cells impermeable. It checks the transpiration. It also provides some support to cell. Sometimes. waxes are also deposited in the cutinited ‘vall. It makes the surface totally impermeable. Calcium salts and silica are also deposited in the walls of some plants. They make the plant surface rough. .•pidermal cells form different structures in seeds and fruits. They form hard shells in seed coats. In some cases, it forms mucilaginous layer for attachment. In some cases, it develops hairs for dispersal. 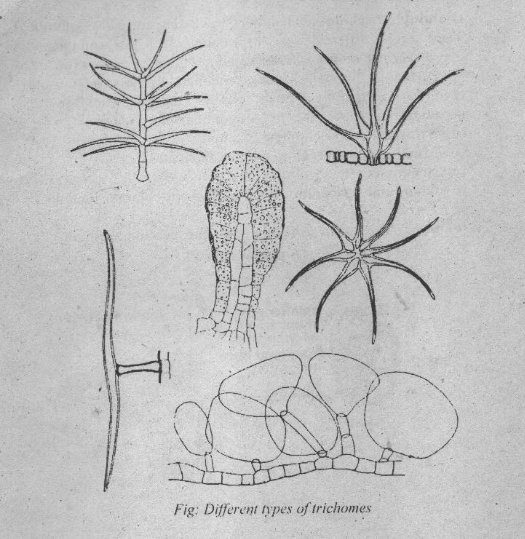 monocot throughout life. But in monocot. they disappear after secondary growth. Frichomes are different types of appendages. Trichomes are commonly present on the surface of epidermis. They are present in the thrm of hairs, papillae and water absorbing roots, triehomes occur in all parts of the plant. Triehomes are often used as taxonomic character. The triehomes may be unicellular or multicellular. They may be glandular or nor-glandular. The scales or hairs may be peltate, tufted, stellate or branched. Hairs of the cotton seeds are unicellular. 1. Non-glandular trichomes: ‘FMy are simple hairs like. These hairs may be unicellular or multicellular. Such hairs are found in cotton. rich in chloroplast and starch grain. Stomatal aperture is simply a space between the two guard cells. The stomatal aperture, guard cells and subsidiary cells form the stomata] apparatus. The guard cells are produced by the vertical division of a single stomatal mother cell. 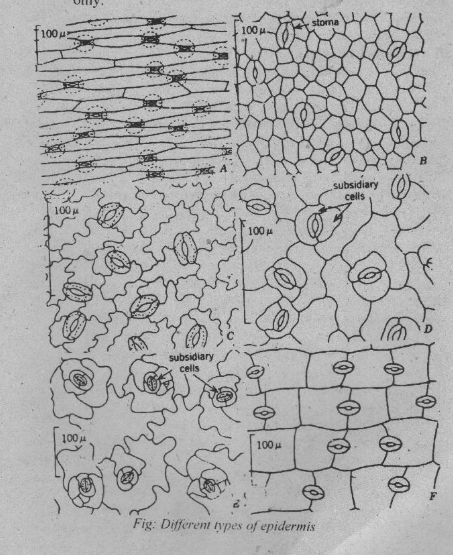 The variation in turgidity in the wall of guard cells cause opening and closing of stomata. Exchange of gases takes place through stomata. When the walls of guard cells are fully turgid, the stomata open. When the walls of guard cells deflated, the stomata close. Anomocytic stomata: In this case, the guard cells are surrounded by certain number of cells. These cells have similar shapes. Example: buttercup. Anisocytic stomata: In this case, the guard cells are surrounded by three subsidiary cells. These cells have different sizes. Example: potato. Diactyic stomata: In this case. each guard is surrounded by two subsidiary cells. The common wall of these cells is at right angles to the longitudinal axis. Actimicytic stomata: In this case, the stomata are surrounded by circle of radiating cells.